My year starts with a whimper. I decided to go slow this month... the thing to focus on is to reduce the number of intraday trades (especially the losing ones ☺). I decided to do discretionary trades today, because with mechanical trading systems, the number of trades often goes out of control... I usually don't put rules around the maximum number of trades per day. For today's discretionary trading, I considered 2 systems. One was the range compression system, that I traded in November. The version of the range compression trading system that I traded in November was mechanical, and resulted in large number of trades on some days. If I had used it to trade today, I would have used discretion to limit the number of trades. Those possible trades are marked on the candlestick chart below. 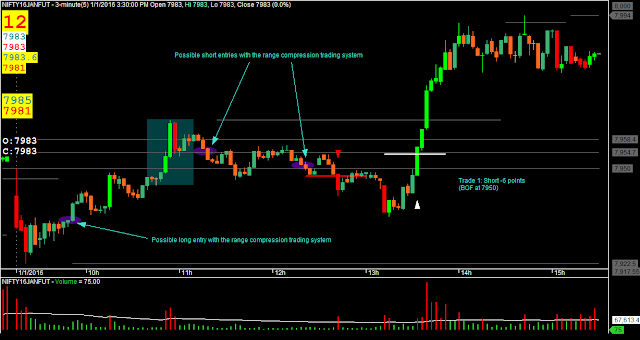 The other trading system - the one traded today - is totally visual for entries, and based on Decision Point Trading. I decided to be very slow about the entries today, and consider only the Breakout Failures and Breakout Pullbacks of Round Numbers. The only entry that I got with it today, resulted in a loss of 6 points. For trailing Stop Loss, I had decided to be mechanical, and move my SL only if I could lock in at least 20 points. Else, I could easily have tightened the Stop even in this trade. Appreciate if you could comment about the trading today.